There is no shortcut when it comes to building and maintaining a credible audio system for your car entertainment system. Factory dash speakers may not be as good as you may have wanted them to be prompting you to try and make the sound system look as good as the car itself. Most of these factory supplied speakers produce dull sound which may not go down well with audiophiles making aftermarket brands to be constantly innovative so as to offer elite performance. Such innovations include the compact 3.5 car speakers that are designed to fit in the smallest spaces bringing your sound quality to enhanced levels. They can be virtually installed just anywhere and they make a huge difference in as far as high and mid-range frequencies are concerned. We have compiled a list of 5 top performing 3.5 speakers from recognized brands to help you as you begin the upgrading process and we can assure you that they are safe bets. Before we get to individual reviews, let’s have a look of these top brand key attributes in summary as highlighted in the comparison table below. Infinity REF3022CFX is an excellent improvement on your existing factory speakers thanks to their sensitivity and frequency response that enables them to produce quality sound. These speakers feature tough built materials allowing them to provide surprisingly strong performance from speakers of such size. They work with an external amplifier and they are also work well with your aftermarket stereo or factory radio. Infinity Plus One Technology: REF3022CFX is designed with the famous infinity plus one technology which offers a larger cone area for the woofer than the usual cone area for speakers in this class. The result of this is increased sensitivity, higher low-frequency output,and much better sound. The woofer features the tough polypropylene and a durable hi-roll rubber surround which provides for great performance from a speaker of such size. Edge-Driven and Balanced Textile Tweeters: Infinity REF3022CFX offers outstanding clarity thanks to the 1/2” edge-driven, balanced textile tweeters. With these tweeters, the speaker reproduces very smooth music at all times irrespective of the output level. It brings out every detail without sounding harsh at any particular time. In addition to this, these speakers offers an adjustable tweeter output level that ranges between 0dB to 3Db which allows you to customize the output depending on where the speakers are installed. Customized Frame Size: These speakers come in a compact design with a customized frame size that allows them to installed in just any car without any modifications. The speakers can be mounted in just any location and the included adhesive foam gasket strips helps in the installation process by ensuring that the speakers are held firmly and that they remain in place. Works Well with any Power Supply: These speakers are good to go with as little as 25 watts RMS power and the good thing is that they can also be powered with an external amplifier. The speakers’ 3-ohm impedance combines with that of the speaker wire to yield 4–ohm to ensure that you get the best out of the system. Additionally, these speakers are compatible with just any factory radio or aftermarket audio systems. It is compatible with most car stereos. These speakers come with bass blockers. The silver detail gives these speakers an attractive style. Amazing sound quality with minimal distortion. They deliver well-balanced sound at all ranges. These speakers are sensitive to physical shock hence they need to be handled well during installation. An external amplify is required. Our Verdict: With Infinity REF3022CFX you can rest assured of great sound with no unwanted distortion or noise as long as the volume is kept at reasonable levels. They fit perfectly in any car and they will definitely elevate you car’s sound to desired levels. Get a taste of detailed sound with the amazing REF3022CFX. Kicker is a popular brand and this particular series is a very affordable upgrade from factory stereo. Kicker 43CSC354 CSC35 is tough and it pays attention to every detail elevating your sound experience to a startling level. These coaxial speakers work best with recommended power of 30 watts and they will serve you for years to come without breaking a bank. Solidly Built: 43CSC354 CSC35 from Kicker features a solid polypropylene woofer that offers solid sound through and through and it does this with the help of the durable polyester foam surround that stays still for many years. The PEI tweeter reproduces smooth sound and it pays attention to vocals and instruments details bringing your music to life. Sleek Mounting Profile: The Kicker 43CSC354 CSC35 features a sleek mounting design that allows you to install the speaker behind the grilles without struggling. This design leaves a lot of free space and you will especially like it if tidiness is among your priorities. To add on that, the tweeters are positioned in such a way that they do not protrude which means that you will get to enjoy great sound without interfering with other aspects of the car; as long as there is enough space to accommodate the speakers. High Sensitivity: More Sound Output: These speakers features a high sensitivity design which means more sound output. The sound output is not affected even when you pair them with low powered factory radio. Featuring 88 dB and 30 watts RMS continuous power, the speakers sound great and perform impressively for speakers of that size and for the price as well. Incredible Speaker-Amp-Matching: 43CSC354 CSC35 has been designed to match with just any external amplifier in an attempt to get the best out of the system. However, the two must be compatible in every aspect. In addition to this, this speaker works well with most factory radio and stereos. Strong built with quality durable materials. It is compact and lightweight; it can fit anywhere in the vehicle. Modern design with funky looks. Relatively affordable as it is the cheapest in our list. Our Verdict: Kicker 43CSC354 CSC35 won our hearts for its great sonic performance coupled with budget price. To get the best out of these speakers, you can power them with an aftermarket stereo, a factory radio, or even a small amp. Don’t hesitate to get these pair of speakers for a quick and affordable upgrade. Music has never sounded this good,especially when coming from a small speaker such as the 3.5 speaker range. Polk Audio DB351is engineered to produce well-balanced sound with minimal distortion and the good thing is that it has a good bass response too. What makes this speaker stand out from the rest is that it is marine certified meaning that it can be used in boats and ATVs. It is also designed to withstand other harsh weather elements. Incredibly Versatile- These 3.5” speakers are highly versatile with their shallow depth that features multiple holes installation pattern which allows for quick drop-in installations in any vehicle on the road. These speakers can also be inverted to fit in tight place but this may have an impact on the quality of the audio when compared to other orientations. Marine Certified- Polk Audio DB351 is also Marine Certified which means that they can be rained on, splashed or hosed down which means that they can be used in boats and other water vessels. However, they should not be fully submerged. In addition, they are also UV resistant meaning that they can withstand long exposure to sun and other unfavorable weather conditions. Polymer Woofers and Silk Dome Tweeters- When it comes to sound quality, Polk Audio DB351 features strongly built polymer 3-1/2” woofers with durable rubber surrounds for enhanced efficiency and increased bass output. In addition to this, the 12 mm liquid cooled silk dome tweeters comes in handy in reproducing well-balanced sound without distortion. The tweeters also feature neodymium magnets for sound clarity. The 2 built-in crossovers direct both the high and low frequencies to the tweeters and woofers respectively resulting into seamless sound flow. Dynamic Balance Design- Good music becomes great when it comes from speakers with great features and great designs. Polk Audio DB351 engineers use the laser imaging to design speakers that will produce little to no resonance and eliminate distortion, giving you a smoother play. The speakers also feature stainless steel installation hardware and rustproof baskets to help in the installation process. Polk Audio DB351 comes with bass blockers to allow you to fine-tune frequencies. The classic silk and black acoustics blend well in any car. Very minimal sound distortion if any. Great sound quality and clarity when making phone calls while using the hand-free set. The tweeter requires mounting depth as they tend to stick out. Bass blockers add extra weight to the car. Some cars may require some modifications for them to fit in. Our Verdict: Polk Audio DB351 will keep on rocking and rolling even under extreme temperatures, rain, and sun without feeling the heat. You can rely on these set of speakers for the reproduction of any music genre. Install Polk Audio DB351 in your car to set it apart from the rest. Rockford Fosgate P132 Punch pumps out commendable amount of bass despite its small size and small range. The highs and mids are incredibly clear although using bass blockers is highly recommended to prevent any distortion. To allow for flexibility during mounting, these speakers come with a flex fit basket which gives room for minor adjustments after they are installed. VAST Technique- The VAST (Vertical Attach Surround Technique) Technique provides a unique way of attaching the surround to the cone which helps to increase the speaker’s efficiency by yielding up to 25% more radiating cone area for richer sound and strong performance without any installation issues. Integrated Concealed Crossover (ICC)- P132 features an Integrated Concealed Crossover which means that the crossover is hidden inside the basket creating a decent look and also facilitating easy installation. The additional polypropylene cone with a butyl rubber surround enables this speaker to withstand long sessions of high volume music. The dome tweeters deliver clear highs even at extended volume levels. ​​​​Flex Fit Basket- This flex fit basket allows you to do any slight adjustments whenever needed after the speakers have been mounted. This basket comes in handy especially when you are using multiple mounting slots as opposed to using single screw sized holes. Build Quality and Convenient Features- These speakers are cheap but they do not compromise when it comes to build quality. They are built to last and they come with 2 years warranty as a sign of commitment. In addition, they are packed with a number of convenient features that includes the OEM adapter that allows you to install these speakers in multiple OEM openings. It can provide excellent frequencies even without an amplifier. Works well with your factory radio. Not as durable: sound quality tends to weaken over time. It cannot handle large amounts of power; high amount of power results in sound distortion. Our Verdict: Rockford Fosgate P132 Punch is here to satisfy your every craving and it is capable of handling intense play sessions without affecting the sound quality. They maintain high level of performance and they are the perfect choice if you are in search of excellent high frequencies. Buy a set of P132 Punch on Amazon at a cost-friendly price. JBL GX302 has deservedly earned a spot in our review due to its excellent sensitivity and attractive cup design. This model has taken into consideration the fact that vehicles are designed differently by incorporating a tweeter deflector that acts as a waveguide allowing for both angled and rotational installation thus optimizing the off-axis performance. 3-ohm DCR Voice Coils- Most factory speaker wires are so thin a condition that hinders the speaker from drawing enough power required to produce great sound. JBL GX302, however, features 3- ohms voice coils that enables the speakers to draw more power from the external amplifier resulting into rich and clear sound; all at a conservative price point. Soft Dome Tweeters- The featured edged-driven, soft dome tweeters enable these speakers to deliver smooth high-frequency response with an increased power handling capacity for the mids and highs which translates into more lifelike sound from the lyrics and musical instruments. Tweeter Deflector Technique- JBL GX302 employs the tweeter deflector technique whereby the deflectors is used a waveguide to allow for rotating or angled speaker orientation all in an attempt to optimize the off-axis performance. This technique recognizes the need for seamless flow of sound throughout all locations in the car regardless of the model. OEM-Level Reliability Testing- Just like other JBL speakers, JBL GX302 has been tested for the same rigid specification similar to the automakers whereby it is subjected to extreme conditions that can potentially destroy weak speakers. To past the test, the speakers are either frozen, baked or subjected to UV radiation to check their reliability so as to ensure that your investment will serve you for many years to come. These speakers come with built-in bass blockers. No sound distortion which is prevalent in small speakers. Designed to elevate weak audio signals. Attractive design with high clarity in songs vocals. No mounting hardware is included in the set. Modifications may be required for them to fit in certain cars. Runs the risk of system overload due to low impedance. Our Verdict: JBL GX302 ensures that you get nothing less than quality which is paired with functionality and the result is excellent performance in the frequencies. JBL GX302 offers you unmatched bass performance all at very affordable prices. Check prices on Amazon. This is the measure of how loud a speaker is depending on power provided and it is measured in decibels (dB). If your car audio system is low powered then you need a set of 3.5 speakers with high sensitivity of about 90dB and above. At the same time, if you have a high powered audio system, a set of speakers with low sensitivity ratings will serve you well. Next, you need to consider the power handling of the speaker so that you able to know the amount of power (watts) that the speaker can handle. If your stereo system features a powerful external amp then you need 3.5 speakers with power handling that is close to the amp output. In short, you need to consider the maximum RMS and peak power handling alike so that to avoid sound distortion in the case of too much power or a scenario where the speakers struggles to deliver due to too little wattage. Most 3.5 speakers are either 2-way speakers or 3-ways speakers. 2-ways speakers are also referred to as coaxial speakers are the most common units and they consist of a standard woofer and a tweeter. 3-way speakers, on the other hand, feature the above components and in addition, they feature the mid and high-frequency range enabling them to produce both the highs and lows resulting into much fuller and richer sound. Although the speakers are meant to enhance your driving experience, it is important that you select a set of speakers that match with the value of your car. It is important that you gather enough information on the speakers available in the market with regard to the specifications and present them to the after-market speaker dealer. This will enable them provide you with speakers with the right configurations as per your car model. The materials used on various speakers’ component have a big impact both the sound quality and general life span of the speakers. The major components feature popular materials such as silk, polypropylene and textile brands that result in the production of warmer sound. Harder materials such as graphite, ceramics or metal are also common and they lead to the production of fuller sound with higher tones. The speaker surround components should be made of materials that are capable of withstanding heat and humidity. The casing around the woofer should preferably be made of rubber as it is more effective and long-lasting. Some woofer may feature foam or cloth surround which is still effective and less expensive. 3.5 speakers have gone through immense developments over the past few years and nearly each customer has a choice befitting their needs. 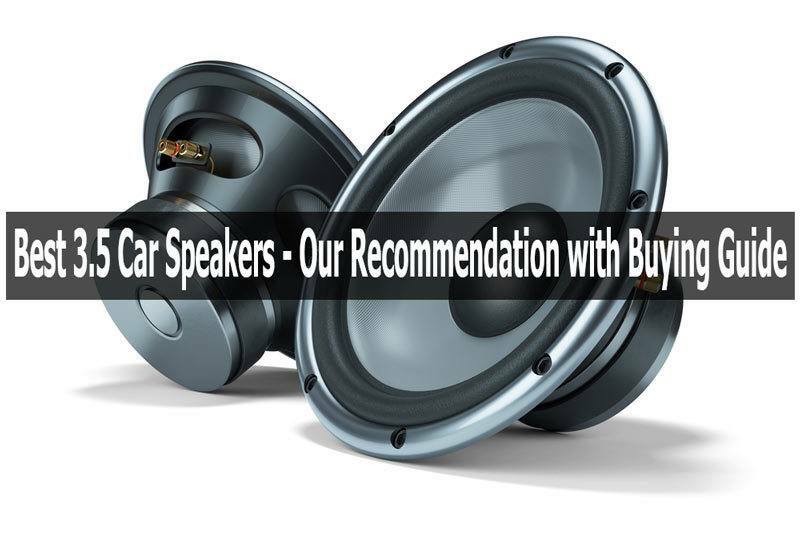 We have considered all important factors to consider when selecting the best 3.5 speakers and we are positive that you will find the perfect one for your car. We picked on Infinity REF3022CFX as our top brand due to their edge-driven and textile tweeters that allows you to have great improvement in your sound experience without adding too much weight to your car. The other models sound and look great as well and they remain our favorite options and although it all comes down to personal taste and brand loyalty, you may want to give them a try.